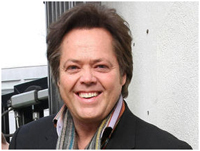 WHILE many celebrities are happy for their offspring to follow in their footsteps, Jimmy Osmond says he has banned his four children from showbiz as he “regrets” missing out on a proper education and normal childhood. The singer is father to Sophia, 17, Zachary, 14, Arthur, 11 and nine-year-old Isabella, who have featured in his shows and are keen to continue the Osmond dynasty. And while he doesn’t doubt they have what it takes to carve out successful pop careers, Jimmy and wife of 20 years Michele Larson have advised strongly against it. “They do want to but I told them no. They’re talented little things and they used to be in some of my shows,” the 48-year-old Long Haired Lover From Liverpool singer tells My Weekly. And it seems that missing out on an education isn’t his only regret. One other thing still haunts him from his days with the char-ttopping Osmond family nearly 40 years ago.